ALL U.K. ORDERS POST FREE! Welcome to 'Albert Prendergast Limited'. 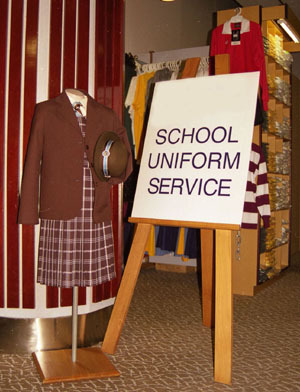 A web shop specialising in traditional school and scout uniform in larger sizes. I am committed to bringing you all those traditional uniform items that many ladies and gentlemen would like to wear...but just can't find in a large enough size. Most of the items I stock are made especially for 'Albert Prendergast' and are very difficult to source nowadays. 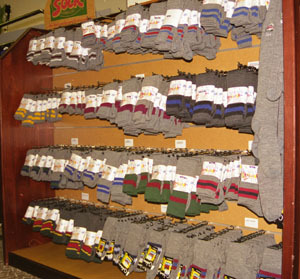 So, if you are looking for; short trousers, knee length socks, caps, boaters, wolf cub & scout wear, gymslips, knickers, etc, then you will find it right here. In fact you will find just about everything not found in the modern school outfitters! Step inside my store and leave your catapult outside! Try on anything you wish and dont forget to pay before you leave or you will certainly receive 6 of the best!! Albert Prendergast regularly sends out a newsletter featuring all of our latest news and products. Typically we send 2 newsletters a month. You can be one of the first to know about any new stock and special offers simply by subscribing to our free newsletter. Albert Prendegast uses Constant Contact as a newsletter service provider. To subscribe simply click on the image opposite. Albert Prendergast has won the Feefo Gold Service award, an independent seal of excellence that recognises businesses for delivering exceptional experiences, as rated by real customers. Created by Feefo, Trusted Service is awarded only to those businesses that use Feefo to collect genuine ratings and reviews. Those that meet the high standard, based on the number of reviews they have collected, and their average rating, are awarded. A badge of honour, this accreditation remains unique, as it is based purely on the interactions with verified customers. As all reviews are verified as genuine, the accreditation is a true reflection of a business commitment to outstanding service. Albert Prendergast met the criteria of collecting at least 50 reviews between January 1st 2017 and December 31st 2017, with a Feefo service rating of between 4.5 and 5.0. Click on the FeeFo logo to visit the Albert Prendergast review page on FeeFo. You can pay for your order in four ways. Pay for your uniform using PayPal. All you need is a PayPal account! 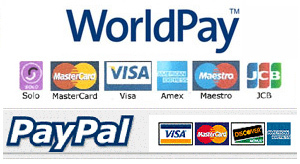 Secondly, if you do not have a PayPal account then you can pay securely using WorldPay. All you need is your credit or debit card. Shown opposite are all the credit and debit cards I am able to accept. Simply choose your preferred on line payment method from the options offered when you checkout. Thirdly, pay over the telephone using your credit or debit card. Simply decide what you would like to order and then call 01298 211135 with your credit card details. Confidentiality: Whatever payment method you use the transaction on your bank or credit / debit card statement will only make reference to 'Albert Prendergast Limited'. All parcels from Albert Prendergast are sent in plain packaging. There is no external indication as to what your parcel will contain. 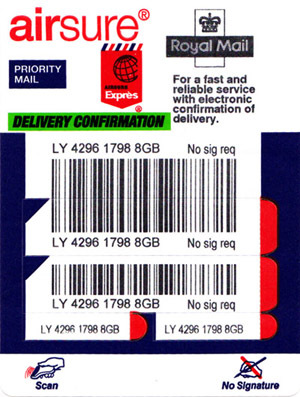 All parcels within the U.K. are sent by standard second class post or as a standard parcel. All U.K. parcels are sent post free, there is NO COST to you. Tracking details of all U.K. orders are supplied in an 'order dispatched' email that you will receive when your goods are posted. Please check the subject line for instant access to this information. If you have an on line account then these details can also be accessed there. If you want your order quickly and you are within the U.K. then there is an option for your parcel to be sent via next day special delivery. You will be able to add this service during checkout. The cost for this service will vary depending on the weight of your package. All orders for next day delivery must be received before 3.00pm. I cannot guarantee next day delivery on orders received after this time. Similarly, all orders received on Friday will be sent for special delivery on the following Monday. Please note. 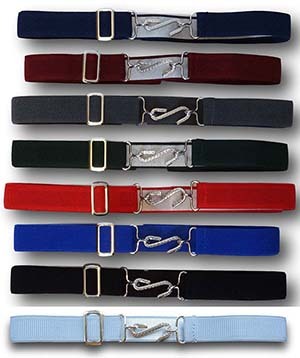 If your order involves alterations to your uniform then you will have to wait until these alterations are completed before your order can be dispatched by special delivery. For those for whom delivery to a home address may prove to be problematic I also offer delivery by 'Collect+'. Delivery via 'Collect+' will allow you to collect your parcel from any one of over 5,800 shops and stores all over the U.K. Please enter your prefered Collect+ delivery shop in the delivery address field during check out. If you do not do this then your parcel will be sent to the Collect+ store that is located closest to your billing address. There is a charge for all U.K. deliveries made via Collect+ and this will be added during the checkout process. You can find out more about how Collect+ works by clicking on the picture opposite. All overseas orders are sent via some form of track & signed delivery. Orders under 2kg will generally be dispatched via Royal Mail. Orders over 2kg will generally be dispatched via UPS. Tracking details of all international orders are supplied in an 'order dispatched' email that you will receive when your goods are posted. Please check the subject line for instant access to this information. If you have an on line account then these details can also be accessed there. The shop has been laid out so that finding the item you want is really easy. If you know exactly what you want then try the search facility. You will find that in the top right hand corner of this page and every page. You can also use the catergory facility. Simply click on the links on the left and you will be taken to the various sections. Most items are available in several sizes so make sure you check the appropriate size before you add your item to your shopping cart. When you have made your purchases and you are ready to checkout just click on the checkout button in the top right of this screen. It really could not be easier! I offer a range of alteration services on many of my items. 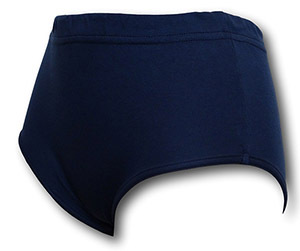 All of my shorts are supplied with an inside leg measurement of 8" or 9". However they can be shortened to any leg length you require. All you have to do is click on the length you would like when you make your order. The appropriate allteration fee will be automatically added to your order total. My blazers can also be altered from standard 2 button fastening to 3 button fastening. Again, just click on the appropriate tab to add the required alteration fee to your order. Gymslips, dresses and skirts can also be shortened. 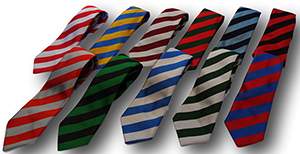 Finally, you can stipulate a grosgrain ribbon braid to be added to your school blazer. The colour range is given along with each blazer. All you have to do is select the colour you require from the drop down menu. Organising your alteration is easy! My shop is entirely web based. I have no conventional high street premises. However I do understand that many clients do like to try before they buy. To that end I offer a bespoke home visit service. 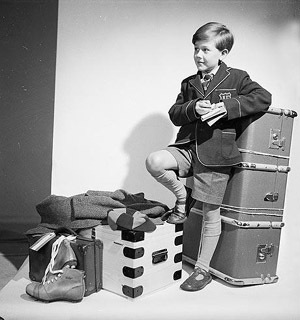 If you want to visit my home and try any of my schoolboy, schoolgirl, cub or scout uniform items then either email or call to arrange an appointment. You will find my details in the contacts section. Visits are STRICTLY by appointment only and will be arranged for a time that is convenient for both of us. To book an appointment to visit please give me a call on 01298 211135. I look forward to seeing you. At the Albert Prendergast Facebook page you can leave your comments and feedback about our products and services. From time to time I will be posting there about new products that may be of interest to new and old customers. Click on the Facebook logo to go to The Albert Prendergast Facebook page. I also run a very succesful eBay shop. 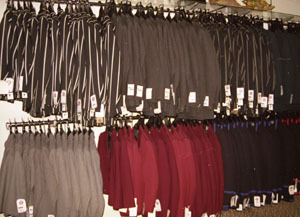 In the shop you will find just about all the school uniform items that are available here. For those of you who would prefer to use eBay (Although I can't think why you would want to.) rather than this site then just click on the ebay logo opposite to be taken directly to my eBay home page. 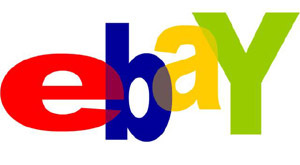 The eBay shop has been running for over 15 years and has a considerable reputation as will be demonstrated by the 100% feedback record. 'Albert Prendergast' can also be found on Amazon. A limited range of my own brand products are currently available. Click on the Amazon logo opposite to be taken directly to my Amazon home page. 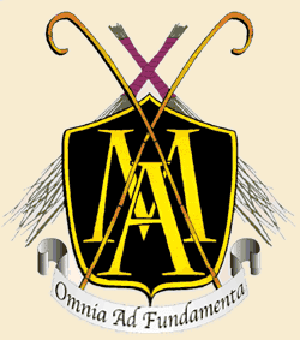 Albert Prendergast is proud to be the official supplier of school uniform to the Muir Academy. In the menu column on the left you will find a section devoted to the uniform requirements of the Muir Academy. 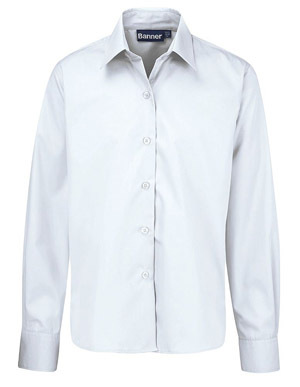 You will find all the items of school uniform that are required for an adult schoolboy or an adult schoolgirl.